A couple of years ago I visited the lovely Marbold Farmstead that was built in 1850 by John Marbold. Arriving from Germany, John Marbold bought 200 acres and eventually expanded his land holding to 4,000. The Marbold family lived an interesting life on this piece of ground and the Historic Marbold Farmstead Association formed to restore the site to its former glory so that current and future generations can enjoy this historic farmstead. One look at the home and it is easy to see that this home was well loved in its day and how important it is to help the association with their goal of restoring and preserving this space as a Living History Farm. For those that have a passion for agricultural preservation, or just plain love antiques, come to the 2nd Annual Antique Show on June 28, 2014. Last year there were around 300 visitors to the 1st Annual Antique Show. The home is open to tour and last year four dealers were in the house. “The home was loaded with antiques. The house looked so beautiful,” Charlotte said. Besides the antique show, this summer Marbold Homestead offers a 2014 Second Sunday Series which should will appeal to all ages. On June 8th, Bob McCue, from Mt. Pulaski, will portray Captain A.H. Bogardus, a civil war veteran and sharp shooter. On July 13, Kathryn Harris will portray Harriet Tubman, abolitionist and conductor on the Underground Railroad. And on August 10th there will be a Civil War Encampment. Company A Mounted Troops Commander, Captain Gregory Kane and his regiment will demonstrate the use of black-powder guns among other things. 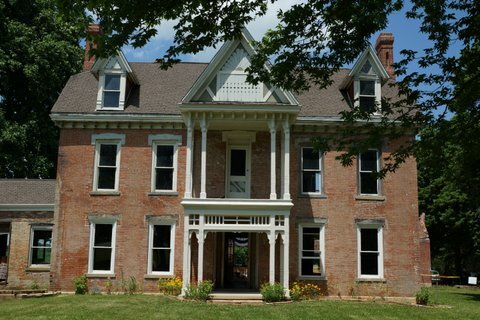 To find out more about these events and see what progress is being made on the Marbold Farmstead, log onto http://www.historic-marbold-farmstead.org/Home_Page.html. Call 217-968-5808 for details. The homestead is 20 miles north of Springfield, Illinois at 21722 State Hwy 29, Greenview, IL . Thank you so much for ‘blogging’ our story of the Farmstead and the events coming up this summer!! We are grateful for your support and efforts to assist us in this way!!! Thanks, Cindy!! Thanks Charlotte! Marbold Farmstead is such a great place!